"There is something out there, he'd said. Something cunning." Is it a mere coincidence that Hunted hit shelves right as the new Beauty and the Beast movie hit the big screens? Probably not, but who knows? Now, I hate to be one of those people, but I have always loved this story. Like, I had a picture book of fairytales that I grew up with, and I maintain that I loved the romantic tale before it was cool. Yeah, yeah, I know, everyone loves it, but whatever, it's true. I have a special fondness for the Beauty and the Beast story and all of its retellings. Having said that, I have also read tons of them, so as soon as I started Hunted, I knew the story was going to have to knock my socks off in order to receive a strong rating. The first thing I really enjoyed about Hunted was Yeva's connection to nature. I loved how she would sit in the cold just to be closer to a window that gave her a view of her precious woods. It made her habit of hunting and wandering the forest seem less forced and clichéd. After all, we all know 90% of fantasy YA heroines know how to handle a bow and arrow, so her penchant for hunting is hardly original. Make no mistake: this is not a typical retelling of the classic fairytale. It starts out much creepier than I would have guessed. We see only glimpses of the Beast's point of view, and from what we can tell, it's nothing kind or human. Blood and death are no strangers in this fairytale. Because this version is so unlike others, I quickly found myself addicted. By the time I was almost halfway done with the book, I was shirking other responsibilities just to spend more time with Hunted. I really, really liked Yeva, mostly because she makes no pretenses. Spooner describes her as a brave character with flaws, and I never rolled my eyes at her over-the-top dramatics or stereotypical YA heroine antics. Sure, she's strong-headed like so many others, but I never found her annoying. The Beast, on the other hand, is a completely different creature (haha I know I hate myself too). But seriously, I've never seen his character painted like this before. I was completely intrigued, purely because he is so unlike any other version I've encountered before. I love this style of fantasy. 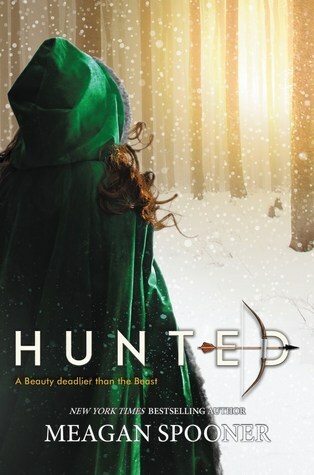 Hunted reminds me strongly of my childhood favorites like East by Edith Pattou (another Beauty and the Beast retelling). It's deep and extremely well-written, as well as incredibly addicting because you don't know what lies on the horizon. Seriously, how can I feel so anxious about what is going to happen in a retelling? Clearly, Spooner made this tale her own in a spectacular way. I can honestly say that this is my favorite retelling by far. I've seen some reviews claiming that the relationships between Beauty and the Beast is dull, and I honestly could not disagree more. The relationship Spooner crafts is so much deeper than any insta-love, and I appreciated the time and energy she put into cultivating its complexity.In the end, Hunted turned out to be everything I wanted, and more. Beautifully written and utterly magical, it's a novel I won't soon forget.